Cliffs and Ruins: 149, 150, 151/365 - The Croatian Saga Begins! I'm back! After two weeks of math, sun, and beautiful weather in Opatija, Croatia, I've successfully returned to the states. Over the next several days, I'll be posting photos and telling stories from my travels. For those of you who missed it, here's the beginning of the story. For the past two weeks, I've been in a resort city (Opatija) on the Adriatic coast of Croatia -- right on the edge of the beautiful Istrian peninsula. The reason? Math, of course! I was at the NATO-sponsored "Information security and related combinatorics" conference, which brought together some of the best minds in modern combinatorics with a wide variety of students, for lectures and time to work together. The conference was a great success, and we had beautiful weather for almost the entire time. In addition to sitting indoors doing math for much of the day, we still had plenty of time to enjoy the beaches (er, I mean rocks -- there was no sand), get lost hiking the countryside (more of that later), and eat at local restaurants. The first image above is the view from my hotel room's balcony -- looking out over the Adriatic sea, towards the rest of the Istrian peninsula. The architecture was amazing, as were the bright colors of the buildings and roofs. You can see the old stone railing in that photo, which was completely normal. Almost every building was made from huge cut blocks of stone, with decorative railings on the balconies, and red tile roofs. I'll feature more photos of these soon. Opatija is a resort city, and has been for centuries -- in fact, they've made something of a business of their history of tourism. They now try to attract tourists by advertising how historical their tourist district is! 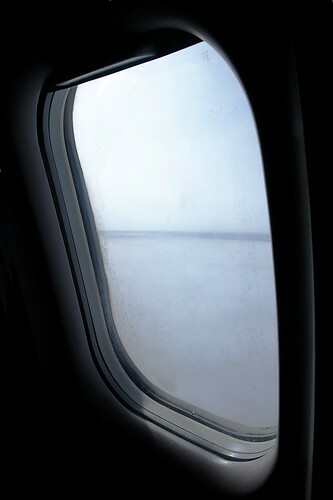 The second photo is a simple view out of my plane's window on the way to Croatia. The traveling was long -- we were in planes, airports, or shuttles for more than 24 hours -- but totally worth it. Finally, there's this third image of... seagulls! Wherever you go, there they are. There were tons of them around our hotel, and these two had an interesting interaction. I spent quite a bit of time one day just taking photos of the seagulls in the air, interacting on rooftops, and generally looking silly. More news, stories, and photos will follow each day, until I'm completely caught up!